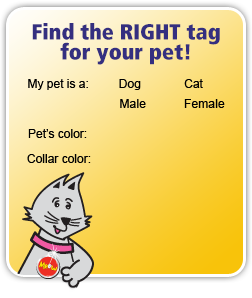 Send us pictures of your pets showing off their new ID tags! We love to hear from you and receive pictures of your pets showing off their new tags. You can use the form below to submit a photo and short blurb about your pet. Our favourite photo will be chosen as the Pet of the Month and featured on our website! For any enquiries regarding your order, please contact us directly. We love to hear from you and receive pictures of your pets showing off their new tags. You can use the form below to submit a photo and short blurb about your pet. Our favourite photo will be chosen as the Pet of the Month and featured on our website! 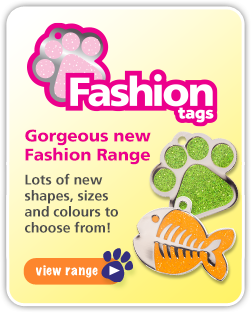 Check out these trendy pets, looking gorgeous in their new tags! Trevor feels pretty slick with his new tag! Floss adores her pink glittery bow, it sparkles against her white fur! Thank you for Poncho's new tag, it's adorable! Nothing less for this little star. Odi loves her new pet tag! Our German Shepherd "Chief" (named after the super rugby team) proudly wears his new Chief logo nametag. Thanks Pet tags! A pink bow to match my nails! Lulu is a rescue now in her forever home. Looking good with his medical alert tag on. Looking so cute with his personalized tag! Loving it! Pretty little bow for our girl. Great quality! Looks fantastic. Xena just had to pose perfectly for a photo once it was put on. My babies love their cat tags, thankyou very much! Mocha loves his new name tag! Looking more handsome than ever. Love love love it and so does reg! 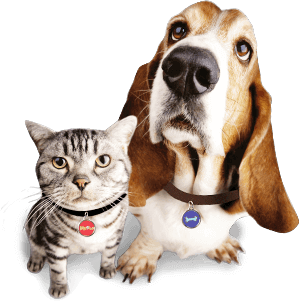 Always purchase my pet tags from your company & have purchased quite a few over the years. Great product / quick service /Reasonably priced / last forever unless cats loose their collar. I now order 2 at a time now one as a back up in case of loss. Dottie (left) & Maggie (right) showing off their new tags. Our new puppy Baxter is rocking his tag and gets lots of compliments on it. 3 Dalmatians with tags on their collars and tags on their harness. Otis now looks very dapper thanks to his blue bow tie from Pet Tags. It really completes his look! Ruskii absolutely LOVES her new pet tag! Would love to follow your Instagram if you have one?! Almost 10 weeks and already spoilt with a glitter pink tag! Nutella's new Yin-Yang. "Bringing out the peace in her eyes"
Orange tag does suite Ginger cat! Xena loves showing off her tag, we have just ordered another one in silver to go with all her outfits!!! Good strong quality!! I'd just like to say how happy and impressed I am with Pet-Tags! Not only was their website easy to use but they kept me up to date with my order and the tag came in a matter of days. Now Ali has a fab looking tag so a big thank you to you! Loves her new sparkly name tag! My beautiful baby with her tag on. This is Princess from Brazil! Very happy with the quality and clarity of the Guz's new pink bow tie pet id tag. She is now one of the fanciest dogs at the park! The only time I can get a photo that isn't blurry is when he's asleep! Thanks so much for the tag! It's so clear, neat and great quality too! Little Buddy's first name tag and it looks great. I am now part of the Bowwow4pets family thank you for my tag. Bobby the 9 week old pup loving her new tag! Ellie, our pet greyhound, is a well-known Canberra fashionista. She has a matching martingale collar, tag collar and lead for every occasion. Naturally, she has a pet-tag for each of her many collars. Our black labrador throws shades of brown in certain lights - but no matter his colour his new tag looks awesome! Indi found a new hiding spot. Haha!! Lily looking very proud with her new tag. Our fur babies rocking their Pet-Tags! Bobby loves his new tag! Harley loves her new tag, will definitely be buying a bling one in the future. Great quality and quick shipping. 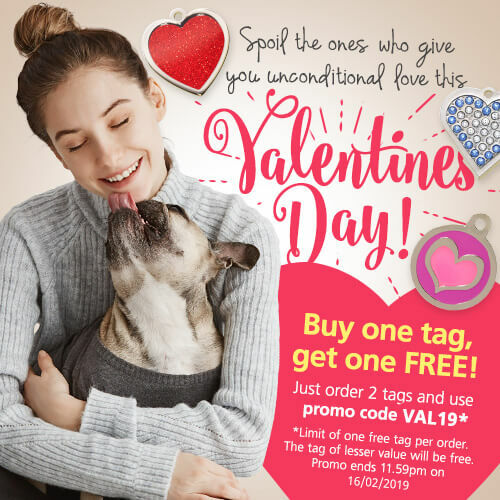 Love your tags - have several to match different collars. Spoilt Poodle!!! Such a beautiful high quality tag! Saoirse loves it! Choco loves her tag. She's had it for a few years now and it still looks as new! Great that I could write a cool phrase on one side of Leo's tag with other important information on the other side!! Mum, ignore the computer...look at me pleases! Luna loves her heart shaped stainless steel tag, it goes perfect with her bright pink collar. Luna will be 2 in June and I bought her tag when she was 6 months old. It has lastest much longer than other tags I have bought. Love it. Puppy Peanut loves her new tag! Very impressed with Mojo's new tag. Amber is looking pretty happy with her new Tag! Charlie loves her new purple heart pet tag! Amber likes checking out the wildlife around here. Tawny's favourite activity is going down rabbit holes - not sure whether rabbits can read the tag though. Love this new tag i got for Toby. It goes so well with his collar. Thank you Pet-Tags. This is our new 11 week old puppy Elsie in her new Pet-Tag. Very happy customers, thank you. Biscuit loves his new tag. Thank you! Marshal is very happy with his pet tag! Thank-you so much for my pet tags! We received it only a few days after order :) Very good quality tags too! Our little Abe loves his new tag! Maybe should have purchased Lexi a pink one. That way everyone would know she's a girl straight away! Indi just loves her new tag! The purple colour goes really well with her orange collar which they both go really well with her colouring! Thankyou so much! I asked for a specially tag so I could make it into a necklace in remembrance of my Golden Retriever, Daisy who recently passed away. Thank you! Lazying about on the couch with his new tag. Thank you! Mr. Moustaches in his new ID tag. Turbo loves his new ID tag! Thankyou! Turbo is a dogue de Bordeaux and is is 2 in January. He spends his days slobbering and lazing around with his best friend Tully our bull mastiff who's 18 months old. They love the beach and getting up to mischief. We love mastiffs! When a three legged dog runs in a wet concrete slab her brass tag washes off beautifully! Although Sandy looks fairly relaxed here she is a dynamic 11 moth old labrador who digs, runs and is lways in need of another name tag! Cooling off after a warm day and a play under the hose! Rocket enjoys playing dolls and running around after the cats. He is a purebred Pug and is 5 months old. A few ago bought this tag for my cat in italy. She has been using it for 4 years. I just bought another similar new one for her with another new address because we are moving house. Thanks Pets-tags.com for making the purchasing so convienient from home and far-away! Pootydoots is a 3 year old Tortie. She loves her daisy tag! She was a rescue from the local humane society and lives with her friends, Lucy, Cooper and Jack. Lucy is a sweet little Torbie. She loves her heart tag! Her brother Cooper wears the Meow tag. She is five years old and is a rescue from the Humane Society. Mr. Handerson Cooper in his Meow tag! Love that Kennel Club tag! Here's Barney wearing his Kennel Club tags! Wee Cody looking at me to say where's more dinner daddy. Spook looks so pretty with his glitter tag! Our miniature pinscher puppy Lacey loves her new name tag. Don\'t we look grand in our new tags! Jasi was our beautiful golden retreiver who passed away last year.